For forty years, Dietmar Steiner has been a leading voice in contemporary architecture. The founding director of the national architecture museum of Austria, the Architekturzentrum Wien, he has served as a consultant, on the jury of many prestigious architecture and urban design prizes, and as commissioner of the Austrian Pavilion at the International Architecture Exhibition of the 2002 Venice Biennale. Throughout his career, he has also lectured at universities and written widely as a scholar and critic. Capping a remarkable and still influential career, Steiner’s Diary is the most comprehensive collection of his writings to date, including some previously unpublished pieces. The book includes lectures; interviews; articles published in daily newspapers and magazines, and longer essays on a variety of topics. Steiner brings to his work a keen critical acumen that draws on decades of travel, research, and contact with renowned international architects, such as Rob Krier, Hermann Czech, Herzog & de Meuron, Rem Koolhaas, Lacaton+Vassal, Jon Jerde, Rural Studio, Wang Shu, or Alexander Brodsky. At the same time, his articles and essays are often amplified by personal observations and experiences. 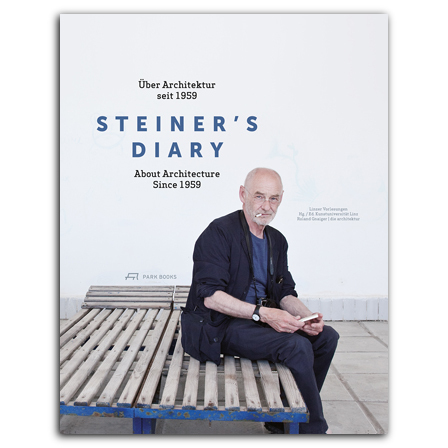 While paying tribute to a prolific scholar and critic, Steiner’s Diary takes readers through four decades of architectural history that represent some of the discipline’s most fascinating historical developments, and it will be welcomed by architects, architectural historians, and anyone with an interest in architecture’s role in society today.